JR the Kiwi’s chicks pictured here were about 5 days (left) and 12 days (right) old at the time of this photo on September 12. By now, the first chick may have left the nest and could be out on its own. 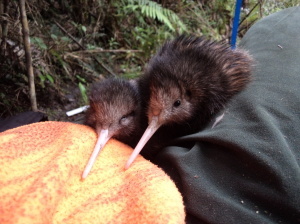 Northland brown kiwi chicks are not fed by their parents, and once they leave the nest must fend for themselves. While feisty, they are no match for stoats at this age. In untrapped areas, stoats kill 95% of kiwi chicks before their first birthday. Once over 1kg kiwi can fight off most predators except for large feral cats, ferrets and dogs. Luckily for these kiwi, they are protected by the Backyard Kiwi trapping network and part of a community that takes good care to walk their dogs on leads, and tie them up at night and when they leave their properties. Under the care of the Whangarei Heads community, these kiwi chicks should survive till they are 50 or 60 years old!